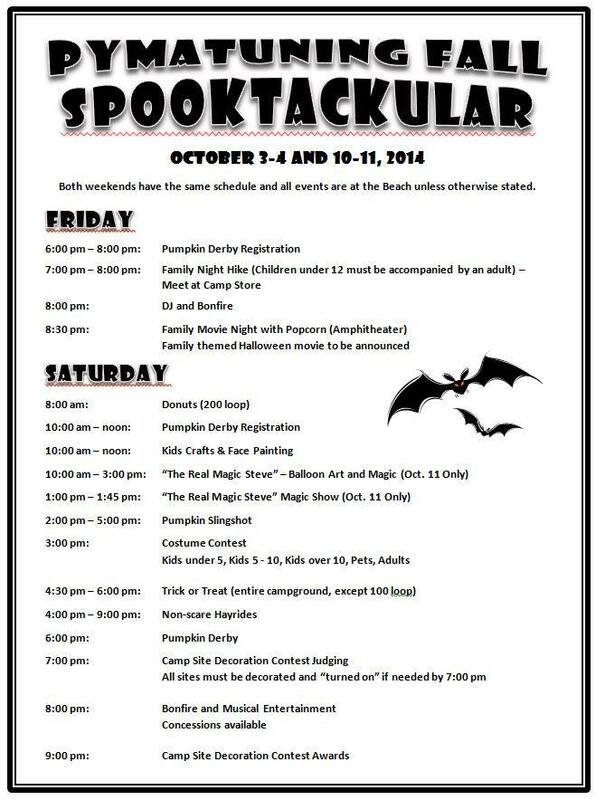 The Pymatuning State Park in Pymatuning, PA hosts their Fall Spooktackular this weekend, October 10 & 11, 2014. This year’s event will be family oriented. They are planning a night hike, movie, kids craft; costume contest for kids, pets, and adults, trick-or-treat, site decoration contest, non-scare hayrides, and bonfire with music. There will also be two new events related to pumpkins, the Pumpkin Derby and the Pumpkin Slingshot. The event is open to the public and there is no parking or entrance fee. Some individual events have a small fee to participate others are free. Food, beverages, and pumpkins will be for sale. Events with a fee are the Pumpkin Derby, Pumpkin Slingshot, Hayrides and Kids Craft. Categories: Family Travel, Pennsylvania | Tags: bonfire, costume contest, Family Travel, Halloween, Kids, kids craft, Mid Atlantic Region, Mid Atlantic States, Mid Atlantic Travel, movie, Music, night hike, non-scare hayrides, Pennsylvania, Pumpkin Derby, Pumpkin Slingshot, site decoration contest, trick-or-treat | Permalink. Over 80 craft beers from over 50 breweries will be available for sampling at the Virginia Beach Craft Beer Festival. Tickets include sampling, a commemorative cup, and live entertainment. The Virginia Beach Craft Beer Festival will be held Saturday-Sunday, October 18-19, from 1:00 pm-6:00 pm each day in a large tent on the beach at 30th Street at the Virginia Beach Oceanfront. The new location will mean the event now has convenient parking at the 31st Street City Garage and will be “weather-proof” for the weekend. Tickets for the Virginia Beach Craft Beer Festival are $25 in advance and $30 at the door for Saturday, October 18, and $20 in advance and $25 at the door for Sunday, September 19. All tickets purchased through Ticketmaster are subject to service fees. A limited number of tickets are available each day. Tickets are only sold at the door if available. O’Connor, Smartmouth, Back Bay, Young Veterans, St. George, Larry’s Lemonade, Ale Werks, Beck’s, Spaten, Legend, Devils Backbone, Bold Rock, Sunken City, Starr Hill, New Belgium, Sweetwater, Heavy Seas, Lagunitas, Victory, Oskar Blues, Southern Tier, Weyerbacher, Harpoon, DuClaw, Gordon Biersch, Goose Island, Kona, Lonerider, Natty Greene, Highland, Redhook, Widmer, Shock Top, Johnny Appleseed, Stella Artois, Fransikaner, Van Steenburge, Bavik, Van Ecke, Leffe, Boddington’s Hoegaarden, La Trappe, Bosteels, Krombacher, Vermont Hard Cider, WM Magner Cider, Flying Dog, Foothills, Hardywood, Heritage, Lickinghole Creek, Sam Adams, Wild Wolf, and Blue Moon. Live music sets the stage at the perfect outdoor setting for tasting some of the best craft beers. Performances include Blue Ribbon Band and Will Overman Band (Saturday), and Seth Stainback & Rooster Foot and Major & the Monbacks (Sunday). Categories: Virginia | Tags: Beer, Beer Festival, Beer Tasting, Craft Beer, Craft Beer Festival, Music, Music Festival, Oktoberfest, Virginia Beach, Virginia Beach Craft Beer Festival | Permalink. When Oktoberfest presented by Yuengling gets underway Oct. 3, the festival will be free for the first time in its history thanks to the Pottsville-based D.G. Yuengling & Son. As part of this year’s Oktoberfest presented by Yuengling, guests will find a number of new attractions and activities to enjoy and explore. These include a free Penn State-Michigan football game viewing party on the Levitt Pavilion Lawn Oct. 11, and a new craft brewers’ village presented by the Brewers of Pennsylvania at PNC Plaza at SteelStacks on both weekends. The festival is also adding pairing experiences featuring great German food and beverages, as well as a new Yuengling Oktoberfest 5k on Oct. 5. The 5k race has already attracted more than 2,000 entrants. Crazy Hearts is one of the most popular country bands in the Lehigh Valley and Eastern Pennsylvania. Crazy Hearts’ high energy, heart pumpin’, foot stompin’ country music will have you singing along and dancing all night to the latest covers of George Strait, Alan Jackson, Miranda Lambert, Reba McEntire, and Taylor Swift to name a few. Lehigh Valley icon Steve Brosky teams up with Jimmy Meyer Extraordinaire (honorably mentioned in “the rock n’ roll hall of fame” with corporate band “The Difference”). From the very start they had “it”, call it chemistry, ying and yang or peanut butter and jelly…however you say it , “it’s” their’s! The Chardon Polka Band’s own distinctive brand of oom-pah combines traditional with zany. While the group seeks to keep old time polka music alive, they do it with their own unique attitude and liveliness. The BC Combo is a highly respected group of singer-songwriters who bring their wealth of experience and passion to Blues, Jazz, Swing, Folk, R&B, Soul and more. Founded in 1935, the Philadelphia German Brass Band is dedicated to upholding the tradition and fostering the continued development of authentic German, Eastern European and American brass band music. Common Bond entertains with a blend of hits from the ’60s to the present including disco, R&B, Motown and Swing. The Mighty Manatees are a group of musicians who play a style known as “dreadneck” music. It is a blend of country, blues, rock, and reggae. Not your ordinary oompah band, Polkadelphia plays both traditional oompah tunes as well as modern cover songs by artists like Radiohead and the Beatles. Ricky Smith & The Crush plays a great variety of dance music from Buddy Holly to Green Day, The Stray Cats and more. Ricky brings spirits back to life with his Stevie Ray Vaughan, Jimi Hendrix styles. The Polka Brothers are a four man band of young polka lovers, out to spread the joy of polka, one wild party at a time. Andrew Portz has captured the sounds of today’s most adventurous indie pop rock and Americana’s purest songwriting traditions to put fouth a sound that will take you back…and lead you forward. Swift Technique, based in Philly, strives to push the musical boundaries in the current music scene. Through the fusion of funk, soul and rock, Swift Technique can be enjoyed collectively by all people. With hard grooves and soulful hooks, Swift Tech will have everyone up and dancing. Philadelphia native Lou Franco takes the word “virtuoso” to a whole new level with his classic rock influenced guitar stylings. Wild Adriatic is a dynamic rock and soul trio from Upstate New York, crafting a powerful yet subtle sound rooted in the basics of American rock and soul music. With a compellingly honest and raw live show, the band has been successfully making friends and fans across the country since January 2011. John Stevens’ Doubleshot is a polka band that can mix up their music to fit any occasion. Dina Hall is an award-winning singer/songwriter who recently released “Logic and the Heart” – a stunning album that blends folk/rock and Americana instrumentation with intimately powerful vocals. Christine Havrilla, a Philadelphia native, who has six studio albums, three EPs, and over a decade of touring under her belt, continues to venture out under “Christine Havrilla & Gypsy Fuzz”, showcasing ALL of her music with new twists. The Apple Strudel Gang is an authentic German band with a bit of the American Songbook thrown in. This 7-member band covers a wide variety of pop/rock and dance music. Siberian surf “rokenrol” that has been conquering the hearts of screaming fans all over the world for more than 15 years. The Whiskey Uproar takes your modern alternative songs and naturally brings a powerful rocking sound and performance. Powerful vocals, heavy hitting drums, soulful melodies, and groovy rhythms are things you will notice that will make you want to get up, dance, and sing along with this band. Jagermeister-sponsored Fritz’s Polka Band plays everything from modern-style polka to country to rock and even blues, resulting in an eclectic mix of musical styles. Friday’s Child is a New Jersey-based rock band that formed in the late 1990s. With a sound like the Goo Goo Dolls and Dave Matthews Band, this group has opened for Uncle Kracker and O.A.R. An explosive, melodic and grooving mix of Jazz, Funk, Rock, and Pop. A pop rock band from Pennsylvania, The Romantic Era has won multiple awards, sold thousands of albums, and rocked hundreds of stages. Categories: Free Admission, Pennsylvania | Tags: Beer Pairing, Beer Tasting, Bethlehem, D.G. YUENGLING & SON, Mid Atlantic Region, Mid Atlantic States, Mid Atlantic Travel, Music, Oktoberfest, Oktoberfest Bethlehem, Oktoberfest PA, Oktoberfest presented by Yuengling, Oktoberfest Steel Stacks, Pennsylvania | Permalink. Summer may be officially over, but there are still more sunny days ahead for beach lovers of all ages. September 18-21, 2014, be sure to check out Sunfest, celebrating its 40th year as Ocean City’s biggest and best festival. Sunfest artists will delight your senses with their art and craft creations. Demonstrating artists will amaze you with their unique talents. Over 30 food vendors will awaken your taste buds with delicious foods from famous Eastern Shore delicacies to pit beef, gyros, Asian cuisine and many more. Enjoy free live entertainment on two stages all day long. Children will enjoy hayrides and inflatables on the beach. Sunfest 2014 has something for everyone. Admission to the four-day event is free. All entertainment is free with the exception of the headline acts, which start at 8:00 p.m. Thursday, enjoy an evening of classic soul hits with the Righteous Brothers’ Bill Medley. Friday night is hot country night with Eric Paslay and Parmalee. Rick Springfield will be rocking the Sunfest tents on Saturday night. Tickets will be on sale at the Roland E. Powell Convention Center Box Office Monday through Friday 9:00 a.m. to 4:00 p.m. or by contacting TicketMaster at 1-800-551-SEAT or http://www.ticketmaster.com. For more information, call 800-626-2326. Thursday, Friday and Saturday 10 a.m. – 10 p.m. The Sunfest Express offers direct service for festival attendees traveling from the Roland E. Powell Convention Center to the Inlet Parking Lot. This is a non-stop express route that takes you directly to the Sunfest grounds for only $3 all day or $1 per boarding. Parking is free at the Convention Center south lot. Shuttles departs the lot every 30 minutes from 9:00 a.m. until 30 minutes following the end of the evening’s last concert, Thursday through Saturday, and from 9 a.m. to 6 p.m. on Sunday. Ride the Boardwalk tram directly to the Sunfest grounds for only $3 per person one-way. The tram runs from 10 a.m. to midnight on Thursday, Friday & Saturday and from 10 a.m. to 6 p.m. on Sunday. * Municipal Lot at 100th Street. Take advantage of the Town’s Park & Ride location on Route 50 in West Ocean City. Park your car for free and hop on the non-stop shuttle to Sunfest $3 all day for $1 per boarding.. If you require special assistance with handicapped transportation, please call 410-723-1606. While at Sunfest, be sure to visit the Official Event Merchandise Tent located just inside the Main Entrance. Don’t forget your official 2014 Sunfest tee. Youth and Adult sizes through 4XL are available. . 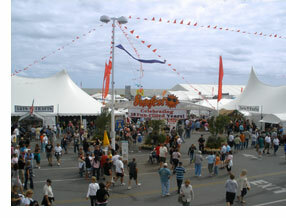 Categories: Family Travel, Free Admission, Maryland | Tags: Concert, Craft Show, Family Travel, Kids, Maryland, Mid Atlantic Region, Mid Atlantic States, Mid Atlantic Travel, Music, Music Festival, Ocean City, Ocean City Beach Fireworks, Ocean City Fireworks, Ocean City Laser Lights, Sunfest, Sunfest Acts, Sunfest Fireworks, Sunfest Schedule, Sunfest Tickets | Permalink. It was the era of a toe-stomping Chattanooga Choo Choo, a time when today’s World War II veterans were young soldiers fighting a major war. 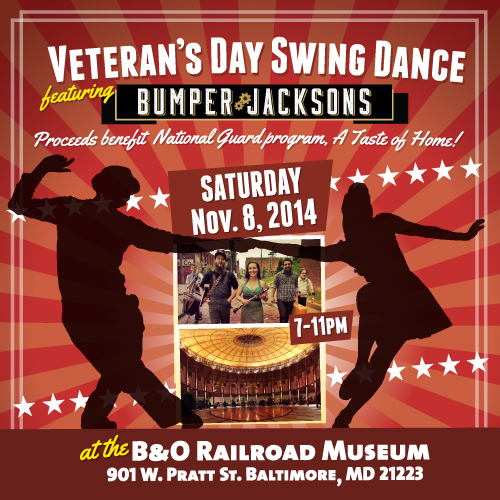 To honor these brave men and women, the B&O Railroad Museum is hosting a Swing Dance inside its 1884 Roundhouse. Bumper Jacksons, recognized as the region’s “Best Traditional Folk Band” at the Washington Area Music Awards last year, are re-imagining early jazz and street blues with power and tenderness, in the spirit of a good old-fashioned dance party! Amateurs receive a 30-minute dance lesson beginning at 7pm. Beer, wine, sodas and light snacks available for purchase. Costume or period dress encouraged but not required. A portion of the proceeds benefit A Taste of Home, an apolitical and non-partisan organization that provides acts of kindness for Maryland’s sons and daughters in harm’s way. Categories: Maryland | Tags: B&O Museum, B&O Museum Swing Dance, Baltimore Swing Dance, Best Traditional Folk Band, Bumper Jacksons, Dance, Maryland, Mid Atlantic Region, Mid Atlantic States, Mid Atlantic Travel, Music, Roundhouse, Swing Dance | Permalink. If you win, you not only get to watch The All-American Rejects or Alan Jackson from the best seats in the house, but dinner and drinks too. Two lucky winners will get tickets to the show in the MINI of Allentown Steel Terrace, where they’ll enjoy the concert from two ridiculously comfy chairs, right up front, along with dinner, drinks and dessert. When you submit the form, you’ll be redirected to the MINI of Allentown Facebook page. They’re the contest sponsor and will be posting the winners of the contest on their page. Enter below for your chance to win the “Best Seats in the House” Musikfest! Categories: Concert, Contests, Pennsylvania | Tags: Alan Jackson Ticket Contest, Concert, Free Musikfest Tickets, Mid Atlantic Region, Mid Atlantic States, Mid Atlantic Travel, MINI of Allentown Contest, Music, Music Festival, Musikfest, Musikfest 2014, Musikfest Contest, Musikfest Headliners, Musikfest Performers, Pennsylvania, The All-American Rejects Contest | Permalink.